Wow WOW!!! This is absolutely beautiful. Yes, these colors are wonderful. I think that pattern is great for Amy. You are an inspiration for me. I have a lot of Amy also, but not sure about 30 yards, I have enough that my daughter wants to be in charge of who gets it if I die before I make a quilt!! My daughter in law only wants Amy Butler as an inheritance, so there you go. Should I make a quilt or leave it for others? Whoops. That should be "off" your stash! Oh Kelly, this quilt is BEAUTIFUL. Your fabric selection is consistently awesome. Did you use the equilateral triangle pattern ? Thank you Vicki! I'm so happy you like it. Yes, I did use an equilateral triangle ruler and then just joined the triangles end to end. Great, rich fabrics. Perfect design for them too. I treasure the Amy Butler fabric scraps that I received from a friend - they just always add the right depth of colour into projects. Love your new quilt - it shows off the fabric brilliantly. Beautiful top! I never thought to make diamonds with triangles! Your quilt is gorgeous! I like the colors but I really like that you chose triangles/diamonds...Looks really good! I like that you used the triangles to make diamonds. Gives it a nice depth, visually. Not sure I envy you binding it with all those angles. I'm lazy that way. Gorgeous. I'm exactly the same with Kaffe fabrics and yet keep buying more. That is beautiful! I love Amy Butler fabric. I have to say I have a nice little bundle. No where near yours but just as precious. I also just bought your unruly pattern from Craftsy and I'm looking forward to having a go at it. Will you make this into a pattern as well? oh, thank you so much! I think you'll love the Unruly pattern, and I'm glad you like this quilt. I won't be doing a pattern because it's pretty straightforward. I just used an equilateral triangle ruler and then set the triangles end to end to make diamonds! I love Amy butler fabrics also and has some in my stash. I am though not looking forward to destashing my self of AB fabrics but I use them little by little in different projects. Your AB projects inspire me. Absolutely gorgeous! Those fabrics all look like little jewels. Well you already know I love Amy Butler - and this quilt is so pretty. Love the triangle/diamonds pattern! Really a wonderful way to show off those beautiful fabrics Kelly! I love this quilt! This quilt is lovely and you've finally got me sold on these fabrics, will be getting some to work with myself. Keep a watch!!! 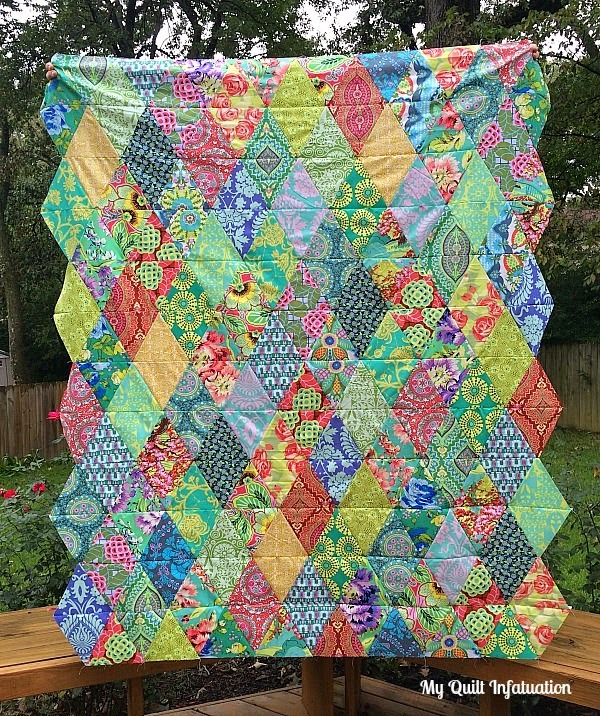 Nice and bright - this quilt is just right! Love the use of the triangles to make diamonds, Kelly. Keep making beautiful quilts like this and you will soon be out of your Amy Butler fabrics.... Unless you cave and get some more!